Here is the second of 12 mixes from THC Series  for the 15 Minutes of Fame Mix Series. 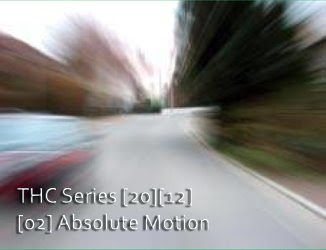 Absolute Motion is another departure from the usual quiet ambient mixes on the Hydrogen Cafe. I wanted to do something that was much more polyrhythmic and incorporated cuts from some Berlin-school electronic artists like Tangerine Dream and Synthetic Block. I wanted to create something very rhythmic that flowed nicely together. I continued the idea of using conventional artists who did unconventional tracks and using conventional tracks in an unconventional way. Once again you will hear U2 masquerading as the Passengers along with the Twilight Sad (an AMAZING indie-rock band!) and Snow Patrol. Excerpts from these artists are intercut with some great polyrhythmic electronic tracks from Synthetic Block, the Irresistible Force, an amazing cut done way back in 1966 by Raymond Scott, Tangerine Dream, the Alan Parsons Project (I Robot was the very first LP I ever got! ), a snippet of Vir Unis and a great cut by Saul Stokes. I also tried to incorporate field recordings that were rhythmic in nature as well. (navigation) Motion relative to a point fixed on the earth's surface or to an apparently fixed celestial point. (physics) Motion of an object described by its measurement in a frame of reference that is preferred over all other frames.